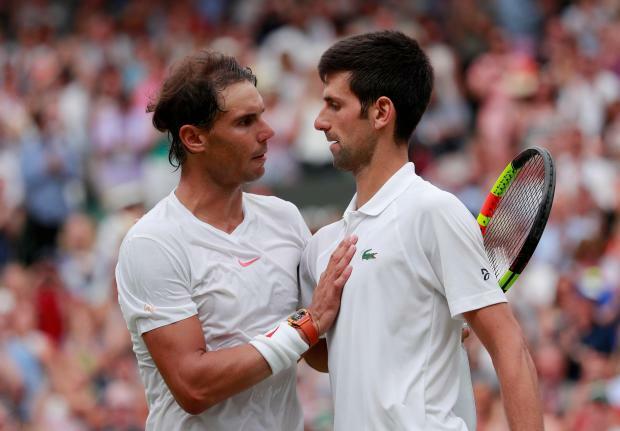 Serbia's Novak Djokovic reached his fifth Wimbledon final as he resisted everything great rival Rafael Nadal could throw at him to win 6-4 3-6 7-6(9) 3-6 10-8 in a two-day classic that concluded in nerve-jangling tension on Saturday. Twelfth seed Djokovic resumed two sets to one ahead after snatching a third-set tiebreak the previous night before Wimbledon's 11pm curfew left the match on a knife edge. As it was for the first three sets the Centre Court roof was closed and, again, the quality on display was sensational. Nadal grabbed the fourth set to set up a monumental 91-minute decider that Djokovic clinched when Nadal fired a forehand wide. The match lasted five hours 15 minutes making it the second longest Wimbledon semi-final after the six hour 36 minute marathon won by South Africa's Kevin Anderson against John Isner on Friday.